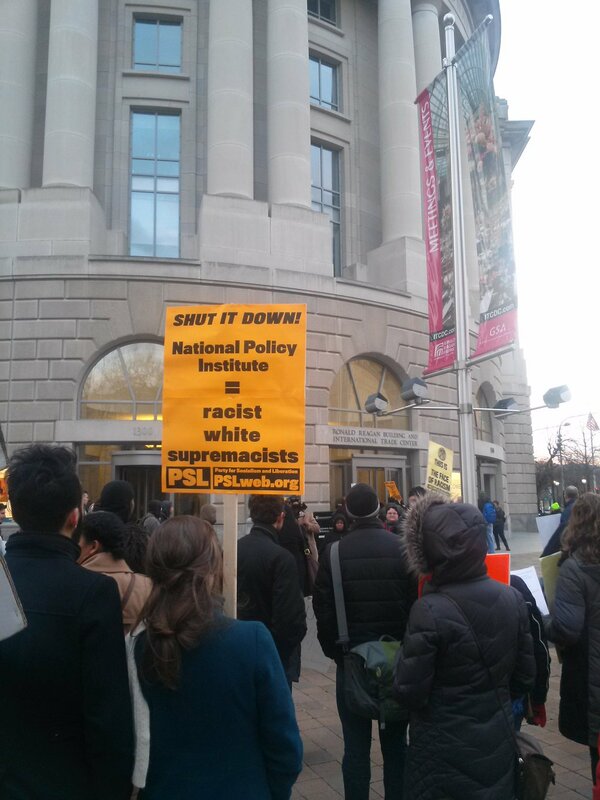 Richard Spencer, the National Policy Institute(NPI), and the rest of the Alt Right hid behind the security of the government backed Ronald Reagan Building in Washington, D.C. on March 5th. Every year NPI, who is the definition of suit-and-tie white nationalism, holds two conferences. This spring conference is the shorter of the two, usually just taking up just an evening and having three speakers rather than a full line-up. This conference was called Identity Politics, which is a play on the identify politics that have permeated leftist space. Since their “identitarianism” is all about advocating for “white identity,” they often attempt to claim that they are just like feminists, black advocates, or LGBT people, advocating for their “own interests.” The event could easily have just been Donald Trump themed as that is what the promotional material, and all the speeches, consisted of. The three speakers were well traveled, starting with NPI’s president and the founder of the Radix Journal and, formerly, Alternative Right, Richard Spencer. Spencer has become a leader of this American version of the New Right, now called Alt Right after the term he coined for the various forms of dissident right-wing strands of thought. Spencer has become a leading voice mainly because he controls the platform, where he gives very similar whimsical speeches that are devoid of strategy and tactics. That was essentially what was at play this evening as Spencer rapped poetic about Trump, elevating him towards their intellectual tradition while ignoring the fact that Donald Trump’s racial politics are a form of primitive populism rather than the elitist right-wing philosophy they advocate. RamZPaul did a version of his regular sort-of-stand-up, this time explaining what the Alt Right is in a speech ironically called “The Alternative Right and Masturbating to Anime.” This was a reference to a recent Republican commentator Rick Wilson who said on MSNBC that Donald Trump supporters had “Hitler iconography on their Twitter accounts” and “masturbated to Anime.” This speech seems sort of like child’s play for Paul, yet he usually does this type of comedic exposition, with previous ones for topics like the Dark Enlightenment. RamZPaul became an internet sensation with his racist and anti-modern comedy routines, which are bare-bones, talk-into-the-camera fare. This seemed to have some relevance when he was the only person doing a funny act inside of the Alt Right, but now that the Right Stuff and their various skit-makers have come along, RamZPaul seems as though he has become obsolete. This was extra apparent on the 5th as he bumbled along his speech, missing most joke opportunities and showing obvious how limited his knowledge was beyond Alt Right talking points. The largest attraction of the three seems to be Professor Emeritus of the University of California at Long Beach Professor Kevin McDonald. We have covered McDonald at length in the past as he is the most prominent and persuasive anti-Semite of the last fifty years. His Culture of Critique book series declares Judaism to be a “group evolutionary strategy” that Jews use to compete with Gentiles for resources. They use their ethnocentrism, high “verbal intelligence,” and cripsis to undermine Western values like nationalism, identity, and masculinity. They do this by creating pseudoscience that are meant to actually disrupt society, such as Boesian Anthropology, Freudian Psychology, and Frankfurt School Marxism. His conspiracy thinking now says that Cultural Marxism (a term they invented), started by Jews like Leon Trotsky and Theodor Adorno, injected the egalitarian values of Marxism into the social sphere, where they undermine national identity and natural hierarchies. He has been able to create a veneer of science over a unified theory of anti-Semitism, which white nationalists, neo-Nazis, and their ilk have rallied around in an effort to try and explain their anti-Semitism. He has been open (since receiving tenure, at least) about his racial nationalism, editing the white nationalist web-publication The Occidental Observer and the journal the Occidental Quarterly. Most recently, McDonald has been working on a book on the history of the “white race,” which uses outdated ideas such as Nordicism and eugenic understandings of racial differences to try and construct a narrative about Aryans. Instead of going into most of that trite, he went back to the favorite recent subject of the other two speakers: Donald Trump. He could not get far beyond his admiration for Donald, though even he could not seem to justify Donald’s spastic buffoonery by caking it in “identitarian” terms. He went on to say that the GOP had not lived up to their demographic base, namely helping out white men. The crowd was noticeably smaller than October’s gathering, closer to 150 people, which was in part because it was a smaller event and because it had been less promoted. The major difference was that the anti-fascist presence outside was both larger and more confrontational, a turn that shows how the relevance of the Donald Trump candidacy is also bringing out Antifa supporters to get involved in counter-organizing. Effigies of speakers like RamZPaul were hung out, and photos of participants taken so as to lift the veil that many of these internet focused race trolls tend to hide behind. This included an official participation from the Party for Socialism and Liberation(PSL), who has signs reading “SHUT IT DOWN! National Policy Institute = Racist White Supremacists.” This was an incredible turn as anti-fascist organizing is often perceived as being exclusively an anarchist movement, and this kind of unity is going to be crucial now that we are up against an increasing threat of Alt Right white nationalism. From the racists’ own accounts, there were two guarded elevators in which to enter and some were able to evade the growing crowd of several dozen anti-fascist protesters, which gives Antifa a tactical advantage at NPI’s coming Fall event. Covering these entrances provides them the opportunity to take photos that can later be used to identify participants, many of which (especially in the Daily Shoah and My Posting Career crowd), are hiding behind their podcast microphones and Twitter handles. Events like this are now explicitly using Donald Trump as a rallying cry as the event was more or less a universal declaration of Trump love. Richard Spencer did caution against believing that Donald Trump himself was Alt Right, but instead noting that they both have a common trajectory and that Donald Trump is mainstreaming their positions of ethnic nationalism, enforced hierarchy, and racial hatred. This should mobilize anti-fascists to replay what happened in Chicago at other Donald Trump events, where their numbers can easily overwhelm the silly tough-persona of the proposed Lion’s Guard. It also shows that this Donald Trump mobilization can be used reflexively to go after explicit white nationalists, and that an anti-fascist movement is only growing. Take pictures of them…so they can be made to wear yellow stars?